This post on Richardsonian Romanesque homes is the first in a series that will help you identify house styles. While on an Old House Society Tour of Homes, Kim and I saw everything from a tiny cottage to an enormous Victorian. There aren’t many Richardsonian Romanesque homes around here, so we were excited to see one. Even though it was not on the tour, so we could only ogle it from the outside, it’s an excellent example of Richardsonian Romanesque homes. Since this is such an interesting style, it’s worth a closer look. The Richardsonian Romanesque style is named after architect Henry Hobson Richardson (1836-1886). 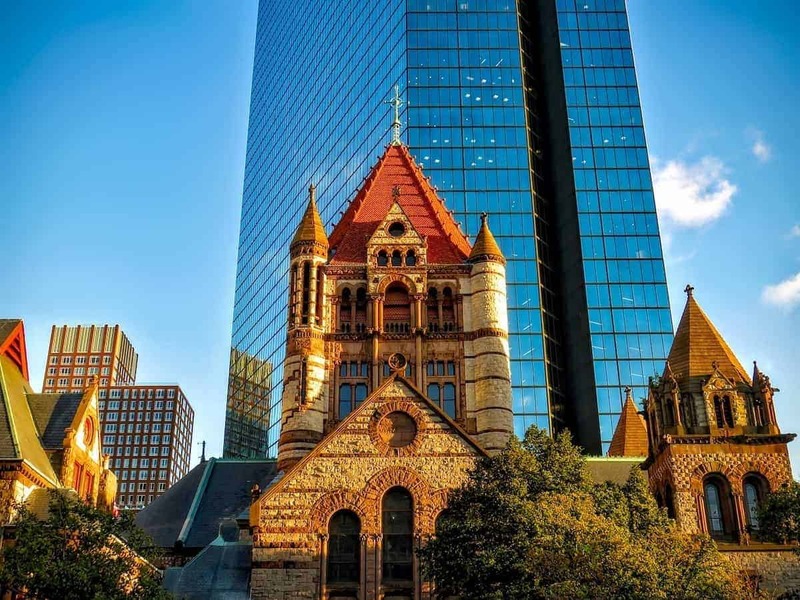 One of his most famous buildings is Trinity Church in Boston. The church’s style and massing was inspired by both medieval buildings and those of ancient Rome. Eventually, other architects adopted this aesthetic and the Richardsonian Romanesque style was born. Richardsonian Romanesque homes became popular during the 1890’s. Here is the Richardsonian Romanesque home that we could only view from the outside. It reminds me of a medieval church, monastery, or even a castle. Notice that except for the columns, this home has all the characteristics listed above of a Richardsonian Romanesque home. Just like in a medieval building, this home also has large stone lintels over the windows. While not required in a Richardsonian Romanesque building, both towers have battlements which make it look even more medieval. The house has two different towers – a three story rectangular one and a two story round one. Grouped windows are another characteristic of Richardsonian Romanesque homes. These homes often have groupings of three or more windows. This house has a group of four windows above the porch. The giant rounded arch over the entry is also a typical characteristic of this style. While not characteristic of this style, the side wall of the porch is interesting because it isn’t solid. Instead, blocks and voids form the wall. Since Richardsonian Romanesque homes are pretty rare around here, I’m going to use Altgeld Hall on the campus of the University of Illinois, to illustrate many of the style’s characteristics that could also be found on houses. This massive building features a main hip roof with a front gable, and two towers on the front. The rectangular tower has a typical hipped roof. It houses the University Chime carillon. Although the overall shape of the building is asymmetrical, the windows and arches of the entrance wall are completely symmetrical. The entry arch has beautifully carved decorative colonnettes with leaf capitals. The side elevation of Altgeld Hall has both a round tower with a conical roof, and a polygonal tower. Windows are often placed in pairs with colonnettes and a larger arch surround in a Richardsonian Romanesque building. The ashlar walls flare outwards to make the building appear more massive and grounded. The windows are deeply recessed into the walls. This closeup shows the square shaped (ashlar) stone with its rough cut face. You can also see a bit of the original color of the pink limestone. I hope this helps you to identify Richardsonian Romanesque homes the next time you see them. If you’re looking for a great resource to identify the architectural styles of houses, take a look at A Field Guide to American Houses by Virginia Savage McAlester. She does a great job explaining the characteristics and providing photographic examples. « Mini Kitchen Remodel Part 2 – It’s Done!